Born February 25, 1877 in Gurtuchrane, Annascaul, County Kerry, Ireland. Was a member of 3 Polar Expeditions The Discovery Expedition and the Terra Nova Expedition under Captain Robert Scott, and the Endurance Expedition with Ernest Shackleton. Saved the lives of Garrard and Bowers on the Terra Nova Expedition, when sea ice broke up beneath the mens camp. Crean leapt from floe to floe until finally he reached the Barriers icy cliff face which he somehow scaled, and sought rescue for the men. Crean trekked to within 150 miles of the South Pole with Scott, before being sent back as part of the last supporting team with Evans and Lashly. Evans became critically ill with scurvy and had to be hauled on the sled by Crean and Lashly who had refused to obey Evans’ order to leave him behind. When Evans was nearing certain death, Crean left him in the care of Lashly and embarked upon his epic Solo March, where he walked the final 36 miles of the return, alone, without navigation skills and with just a couple of biscuits and chocolate to sustain his effort. It took him 18 hours to complete, in what has been described as the single most, greatest act of bravery, in the history of exploration. Evans was successfully rescued and survived the ordeal. 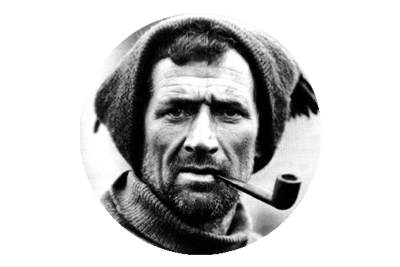 Crean’s heroics were again to the fore on the Endurance Expedition after the ship was trapped and sunk by the ice pack. He captained the smallest and most vulnerable of the lifeboats, the Stancomb Wills on the perilous journey to Elephant Island, and from here Crean was one of six men who undertook an almost suicide mission – sailing 800 miles across the notoriously violent Weddell Sea in a lifeboat. Having eventually landed safely on South Georgia Tom Crean, Ernest Shackleton and Frank Worsley successfully crossed the uncharted, ice laden mountainous interior of South Georgia, and organised the safe rescue of the 22 men stranded on Elephant Island. Born 22 February 1872 in Akaroa, New Zealand. Was a member of Shackleton’s Imperial Trans-Antarctic Expedition ( The Endurance ). After the Endurance became trapped and eventually crushed by the ice of the Weddell Sea, he and the rest of the crew sailed in three lifeboats to Elephant Island. 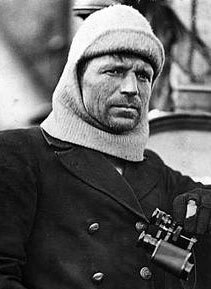 Worsley set course and guided the boats through a maze of ice and treacherous sea. Once on Elephant Island, Worsley was one of six men selected, who crossed the Weddell in the James Caird lifeboat, and it was Worsley’s navigational skills that were largely responsible for their safe arrival at South Georgia. Any mistake in calculation by Worsley, who had to take his readings in appalling conditions, would have seen the boat sail into a vast expanse of ocean, with no hope of return, or survival. Basically he had twice taken aim at two specks in a mammoth body of water, and he twice succeeded in hitting the target, despite the huge odds stacked against him. Worsley’s navigational prowess was again called upon when he, Shackleton and Crean had to cross the uncharted and perilous interior of South Georgia to reach a Norwegian whaling station on the islands Eastern flank. 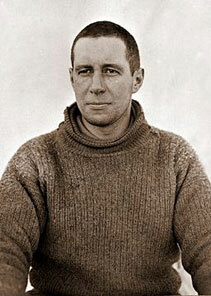 Lawrence Oates, walked out of the tent of the Polar Party, and into the annals of Antarctic heroes on March 17th 1912. Oates had worked tirelessly on the outward journey as his was the task of tending to the ponies that were used to haul supplies across the Barrier. Oates missed many nights sleep and several crucial meals as he fought against the elements, to protect the beasts from the severe blizzards that occurred during the trek. Having successfully reached the foot of the Beardmore Glacier, Oates had expected he would be sent back to base with the second returning team of four, but Scott instead selected the former soldier to be among the last eight to push on and ultimately selected him to go all the way to the South Pole. On the return journey from the South Pole, Oates was suffering immensely from badly frostbitten feet, and the effects of scurvy. The team had retraced their steps across the Plateau and down the Beardmore Glacier. Edgar Evans had died near the foot of the Glacier. As the remaining men battled onwards, Oates struggled to keep pace, and the team were failing to reach the crucial supply depots in time, as they could not cover the distances required, at their current rate of progress. Oates had asked his three companions to leave him behind, but they were not prepared to do that. As they sheltered from a blizzard in their tent, on March 17, Lawrence Oates uttered the now legendary words, “I am just going outside, and may be some time,” as he left the tent, never to be seen again. Scott wrote in his journal, “We knew that poor Oates was walking to his death, but though we tried to dissuade him, we knew it was the act of a brave man and an English gentleman.” Unfortunately the sacrifice of Oates was in vain, as Scott, Bowers and Wilson only progressed a further 20 miles, before a blizzard trapped them in their tent for days, and they slowly starved and froze to death. Sir Ernest Henry Shackleton, CVO, OBE, FRGS ( 15 February 1874 – 5 January 1922) was a polar explorer who led three British expeditions to the Antarctic, and one of the principal figures of the period known as the Heroic Age of Antarctic Exploration. Born in County Kildare, Ireland, Shackleton and his Anglo-Irish family moved to Sydenham in suburban London when he was ten. His first experience of the polar regions was as third officer on Captain Robert Falcon Scott’s Discovery Expedition, 1901–04, from which he was sent home early on health grounds, after he and his companions Scott and Wilson set a new southern record by marching to latitude 82°S. During the second expedition 1907–1909 he and three companions established a new record Farthest South latitude at 88°S, only 97 geographical miles (112 statute miles, 180 km) from the South Pole, the largest advance to the pole in exploration history. Also, members of his team climbed Mount Erebus, the most active Antarctic volcano. For these achievements, Shackleton was knighted by King Edward VII on his return home. After the race to the South Pole ended in December 1911 with Roald Amundsen’s conquest, Shackleton turned his attention to the crossing of Antarctica from sea to sea, via the pole. To this end he made preparations for what became the Imperial Trans-Antarctic Expedition, 1914–17. Disaster struck this expedition when its ship, Endurance, became trapped in pack ice and was slowly crushed before the shore parties could be landed. The crew escaped by camping on the sea ice until it disintegrated, then by launching the lifeboats to reach Elephant Island and ultimately the inhabited island of South Georgia, a stormy ocean voyage of 720 nautical miles; Shackleton’s most famous exploit. In 1921, he returned to the Antarctic with the Shackleton-Rowett Expedition, but died of a heart attack while his ship was moored in South Georgia. At his wife’s request he was buried there. Away from his expeditions, Shackleton’s life was generally restless and unfulfilled. In his search for rapid pathways to wealth and security, he launched business ventures which failed to prosper, and he died heavily in debt. Upon his death, he was lauded in the press, but was thereafter largely forgotten, while the heroic reputation of his rival Scott was sustained for many decades. Later in the 20th century, Shackleton was “rediscovered”, and rapidly became a role model for leadership as one who, in extreme circumstances, kept his team together in a survival story described by polar historian Stephanie Barczewski as “incredible”. Roald Engelbregt Gravning Amundsen ( 16 July 1872 – c. 18 June 1928) was a Norwegian explorer of polar regions. He led the Antarctic expedition of 1910–12 which was the first to reach the South Pole, on 14 December 1911. In 1926, he was the first expedition leader for the air expedition to the North Pole. Amundsen is recognized as the first person, without dispute, as having reached both poles. He is also known as having the first expedition to traverse the Northwest Passage (1903–06) in the Arctic. Amundsen joined the Belgian Antarctic Expedition (1897–99) as first mate. This expedition, led by Adrien de Gerlache using the ship the RV Belgica, became the first expedition to winter in Antarctica. In 1903, Amundsen led the first expedition to successfully traverse Canada’s Northwest Passage between the Atlantic and Pacific oceans.In June 1928, while taking part in a rescue mission for the Airship Italia, the plane he was in disappeared. During this time, Amundsen and the crew learned from the local Netsilik Inuit people about Arctic survival skills, which he found invaluable in his later expedition to the South Pole. For example, he learned to use sled dogs for transportation of goods and to wear animal skins in lieu of heavy, woolen parkas, which could not deter cold when wet. Amundsen launched his assault on the South Pole with a team made up of Olav Bjaaland, Helmer Hanssen, Sverre Hassel, Oscar Wisting, and departed base camp on 19 October 1911. They took four sledges and 52 dogs. 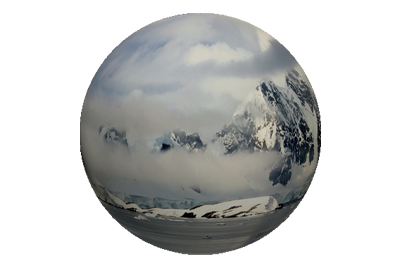 Using a route along the previously unknown Axel Heiberg Glacier, they arrived at the edge of the Polar Plateau on 21 November after a four-day climb. On 14 December 1911, the team of five, with 16 dogs, arrived at the Pole (90° 0′ S). They arrived 33–34 days before Scott’s group. Amundsen named their South Pole camp Polheim, meaning “Home on the Pole.” Amundsen renamed the Antarctic Plateau as King Haakon VII’s Plateau. They left a small tent and letter stating their accomplishment, in case they did not return safely to Framheim. The team returned to Framheim on 25 January 1912, with 11 surviving dogs. They made their way off the continent and to Hobart, Australia, where Amundsen publicly announced his success on 7 March 1912. He telegraphed news to backers. Amundsen’s expedition benefited from his careful preparation, good equipment, appropriate clothing, a simple primary task, an understanding of dogs and their handling, and the effective use of skis. In contrast to the misfortunes of Scott’s team, Amundsen’s trek proved rather smooth and uneventful. ‘Scott of the Antarctic’ was a naval officer and explorer, who died attempting to be the first to reach the South Pole. Robert Falcon Scott was born on 6 June 1868 in Devonport. He became a naval cadet at the age of 13 and served on a number of Royal Navy ships in the 1880s and 1890s. He attracted the notice of the Royal Geographical Society, which appointed him to command the National Antarctic Expedition of 1901-1904. The expedition – which included Ernest Shackleton – reached further south than anyone before them and Scott returned to Britain a national hero. He had caught the exploring bug and began to plan an expedition to be the first to reach the South Pole. He spent years raising funds for the trip. Eight months later, a search party found the tent, the bodies and Scott’s diary. The bodies were buried under the tent, with a cairn of ice and snow to mark the spot. Australasian Antarctic Expedition – Mawson’s exploration program was carried out by five parties from the Main Base and two from the Western Base. Mawson himself was part of a three-man sledging team, the Far Eastern Party, with Xavier Mertz and Lieutenant Belgrave Ninnis, who headed east on 10 November 1912, to survey King George V Land. After five weeks of excellent progress mapping the coastline and collecting geological samples, the party was crossing the Ninnis Glacier 480 km east of the main base. Mertz was skiing and Mawson was on his sled with his weight dispersed, but Ninnis was jogging beside the second sled. Ninnis fell through a crevasse, and his body weight is likely to have breached the snow bridge covering it. The six best dogs, most of the party’s rations, their tent, and other essential supplies disappeared into the massive crevasse. Mertz and Mawson spotted one dead and one injured dog on a ledge 165 ft below them, but Ninnis was never seen again. After a brief service, Mawson and Mertz turned back immediately. They had one week’s provisions for two men and no dog food but plenty of fuel and a primus. They sledged for 27 hours continuously to obtain a spare tent cover they had left behind, for which they improvised a frame from skis and a theodolite. Their lack of provisions forced them to use their remaining sled dogs to feed the other dogs and themselves. There was a quick deterioration in the men’s physical condition during this journey. Both men suffered dizziness; nausea; abdominal pain; irrationality; mucosal fissuring; skin, hair, and nail loss; and the yellowing of eyes and skin. Later Mawson noticed a dramatic change in his travelling companion. Mertz seemed to lose the will to move and wished only to remain in his sleeping bag. He began to deteriorate rapidly with diarrhoea and madness. On one occasion Mertz refused to believe he was suffering from frostbite and bit off the tip of his own little finger. This was soon followed by violent raging—Mawson had to sit on his companion’s chest and hold down his arms to prevent him from damaging their tent. Mertz suffered further seizures before falling into a coma and dying on 8 January 1913. It was unknown at the time that Husky liver contains extremely high levels of vitamin A. It was also not known that such levels of vitamin A could cause liver damage to humans. Mawson continued the final 100 miles alone. During his return trip to the Main Base he fell through the lid of a crevasse, and was saved only by his sledge wedging itself into the ice above him. He was forced to climb out using the harness attaching him to the sled. 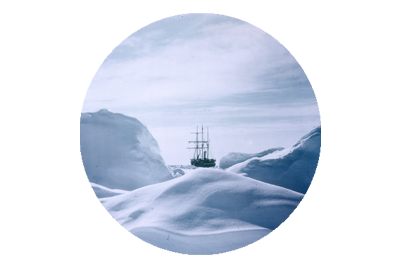 When Mawson finally made it back to Cape Denison, the ship Aurora had left only a few hours before. It was recalled by wireless communication, only to have bad weather thwart the rescue effort. Mawson and six men who had remained behind to look for him, wintered a second year until December 1913. Commander John Robert Francis Wild CBE, RNVR, FRGS (10 April 1873 – 19 August 1939), known as Frank Wild, went on five expeditions to Antarctica for which he was awarded the Polar Medal with four bars, one of only two men to be so honoured. 1 In 1901 he was a member of Robert Falcon Scott’s crew as an able seaman on the Discovery, along with Ernest Shackleton who was then a sub-lieutenant. 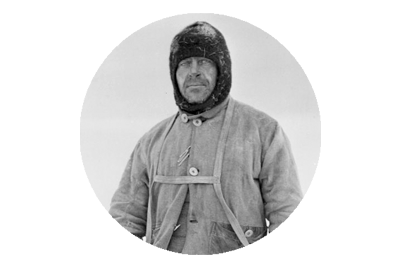 2 He was with Shackleton on the Nimrod Expedition 1908–1909 and was a member of the team that crossed the Ross Barrier and Beardmore Glacier at a record latitude of 88º23’S. 3 In 1911 he joined Douglas Mawson’s Aurora expedition and was in charge of the western base on the Shackleton Ice Shelf. 4 He served as Shackleton’s second-in-command on Shackleton’s Imperial Trans-Antarctic Expedition (1914–1916). 5 He was second-in-command of the Shackleton–Rowett Expedition (1921–22). As second-in-command of the Imperial Trans-Antarctic Expedition, Wild was left in charge of twenty-one men on desolate Elephant Island as Shackleton and a crew of five made their epic rescue mission to South Georgia aboard a lifeboat. From 24 April to 30 August 1916 Wild and his crew waited on Elephant Island, surviving on a diet of seal, penguin and seaweed. They were finally rescued by Shackleton aboard the Chilean ship Yelcho. Point Wild on Elephant Island is named after Frank Wild, with a monument dedicated to the Chilean captain Luis Pardo who rescued him and his men.